but also to everyone who is willing to listen with both an open mind and a willing heart. away from our present destructive path and transform the earth into a true paradise. Alexis Eldridge has a B.A. in Psychology from Hunter College, CUNY, and a Master of Science in Education from Brooklyn College, CUNY. She worked for many years as a guidance counselor for special education children in elementary schools in Brooklyn and Manhattan, and as a clinician in private practice. She is now an artist, an energy healer, an intuitive, and follows her chosen path in partnership and communication with the spirit realm. She lives near Ashland, Oregon. This book is dedicated to all of the people who have been misled by religious authorities, leaving them to feel wounded, skeptical, and betrayed. And also to those in the position of religious authority who are filled with fear and confusion. May the true words of Jesus be a balm and a guide for what is real, that which is free of judgment and separation. I take this as an opportunity to share a realization. I now understand that all those who loved me harshly were helping me turn away from that which wasn’t light, and to turn towards the sun to grow. I see them all now as the shoots and ladders to my destined path. Therefore I am grateful to them. And to those who loved me gently to help keep me on the path . . . thank you. And thank you Chili, my beloved soul companion who stayed with me for the writing of both books. I know she entered into extra innings to help keep me sane during the solitary time of creating. She has also helped me meet my own heart and become better acquainted with the circle of life. Meow, love angel. When I was a child, my mother, sister, and I left the family house. At the age of just turned 21, I moved back into it. The house sat directly across the street from a school that displayed a large cross which peered into my front window. I lived in this house for four years and each Christmas I would tirelessly stare at the cross which was lit for this one day. I didn’t question this nor did I tell my Jewish family. I simply enjoyed, looked forward to, and actually savored the warmth I felt in that union. Back then, I could have never anticipated being the author of two books that bring Jesus’ voice to life. At times it’s still surreal to me. I sometimes struggle with belief in my experience and keeping the faith to stay on this path. And still I have learned so much from my friend, Jesus. It’s important for me to remember, and to share the following story for I believe it was an important brick in the road to here. I was in Charlottesville, Virginia, where I was guided to live after completing healing school in New York. I didn’t know anyone at the time and found myself walking in the woods daily. It kept me sane. Early on I put out a prayer. I said, “I wish I could help others have what I have with Jesus.” He is a mentor, a guide—one who is openly intimate, for no topic is off limits. And no religion was ever offered as an anecdote for what was ailing me. The prayer was answered in its own way. 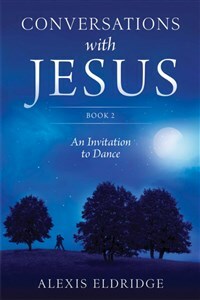 At the end of the first year, which was filled with his teachings, he asked me to write a book. One month later I met a publisher. This path I’ve walked has been challenging, yet the challenges have been mostly with my mind and its beliefs. And of course the task of transcribing for Jesus and asking folks to read the words with the hope of their divinity reigning supreme, is not so simple. But this is what I’m doing and I can’t see doing anything else at this juncture. For I am engaging in my mission and striving to assist others who are also yearning to do so.